The Academy Awards ceremony on Sunday, Feb. 22, 2015 yielded the usual Hollywood glamour and theatrics, along with some surprises. 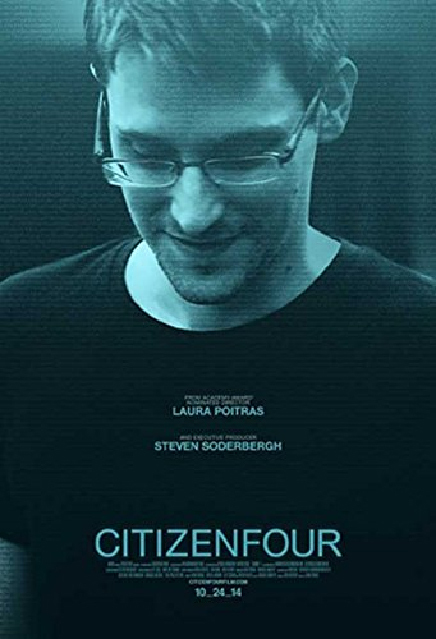 The subject of the film Citizenfour is NSA mass surveillance and Edward Snowden, now living in Russia due to a pending federal case against him as NSA whistleblower. Thus it might not be expected that Hollywood would award a film focusing on a subject of an ongoing criminal case, even if based on the arcane Espionage Act of 1917, intended originally to protect the country from spies using unauthorized communication of national defense information, but now used to punish whistleblowers. But there is a long history of Hollywood feature films, both documentaries and dramatized versions about whistleblowers exposing government or corporate wrongdoing. These include All the President’s Men, 1976 (about the Nixon White House botched burglary of Democratic Party Headquarters); Silkwood, 1983 (about Karen Silkwood, the nuclear plant worker turned activist); The Insider, 1999 (about Jeffrey Wigand and his exposure of malpractice by the tobacco industry); and The Most Dangerous Man in America, 2009 (about Daniel Ellsberg and The Pentagon Papers, revealing decades of lies about the Vietnam war by successive U.S. administrations). Confirming that “courage is contagious,” Edward Snowden says this 2009 documentary on Daniel Ellsberg inspired him to reveal NSA documents as proof of draconian government excesses. Likewise, he is hoping many more whistleblowers will come forward upon seeing the film Citizenfour. Poitras calls Citizenfour “an examination of American power in the war on terror.” She intended it to be the last of a trilogy of documentaries looking at events in the post 9/11 period and impacted specifically by 9/11. The first in the trilogy – My Country, My Country (2006) – is about the Iraq war and its effects on life for the average Iraqi, focusing on an Iraqi medical doctor, father of six and a Sunni political candidate. The Oath (2010) is about Guantánamo prison and was filmed in Yemen and Guantánamo Bay. Since Poitras still has a lot of extra film footage from Citizenfour, as well as unused footage on Julian Assange and others, there may be more films from her on the many issues raised by this trilogy. The prologue to this series was released in 2003 (O’Say Can You See), and consists of a sequence of photographic images taken in and around Ground Zero in NYC in Sept. and Oct. 2001. She calls it “a meditation on loss and revenge.” Poitras resided in NYC at the time and was in Manhattan on Sept. 11, 2001. A documentary filmmaker, journalist, and artist, Laura Poitras grew up in a wealthy family in the Boston area with two sisters (one older and one younger). In 2007 her parents donated $20 million to found The Poitras Center for Affective Disorders Research at the McGovern Institute for Brain Research, part of the Massachusetts Institute of Technology. She had an unconventional education, attending the Sudbury Valley School, where there are no grades, no separation by age, and students direct their own studies. Later on she took courses at the San Francisco Art Institute and at the New School in New York. She originally intended to become a chef, and worked for several years as a chef in a Boston Back Bay French restaurant called L’Espalier. But upon discovering film art in San Francisco she abandoned those plans, continuing her studies at the San Francisco Art Institute. In 1992 she moved to New York City to study at The New School, graduating with a B.A. in 1996. Greenwald’s April 8, 2012 article also attracted the interest of Edward Snowden, who was inspired to select them both as his conduits, largely based on their individual work on national security issues and on this article in particular. Greenwald had offered to write such an article years earlier for Poitras but she had refused, thinking it could make matters worse. Finally she gave in, as the problem had become so acute. She also moved to Berlin, Germany in the fall of 2012, fearing that her source materials for upcoming films would be seized if she remained in the U.S., since the subject matter of her trilogy concerned so many sensitive themes arising in post 9/11 America, including the national surveillance state. She joined Glenn Greenwald and Jeremy Scahill in late 2013 as co-founding editors of The Intercept, launched on Feb. 10, 2014 and with initial funding by e-bay owner Pierre Omidyar as part of his First Look Media. We should find clues for all these points in the astrological birth chart, including her wealthy Boston family and two sisters, a highly successful and prolific career in documentary films starting from 2003 or earlier, and possibly a propensity to keep her birth data secret – for reasons knowable or unknowable, in part given the extent of her harassment by the government for her film work. Meanwhile, she began receiving awards for her films from 2003 onward, though with greater acceleration from 2012 onwards, including the “Genius Grant” from the John D. and Catherine T. MacArthur Foundation, announced on October 2, 2012. Poitras became one of 23 MacArthur Fellows for 2012 around the same time she left the U.S. to live permanently in Berlin, Germany. To date, no details of a romantic partnership have emerged, though Poitras has had a wide range of distinguished collaborators in her work. In 2016 she will have her first solo exhibition at the Whitney Gallery in New York City. When a birth time is unknown, it can be set for 12 noon local time, reading from the Ascendant or the Moon as sub-Ascendant. Or a speculative Ascendant can be chosen through a process called rectification, if there is sufficient biographical information. Though there is a slight chance the birth year may be 1964, I prefer the date that was originally posted and recorded: Tues. Jan. 16, 1962, Boston, Massachusetts. My speculative rectification is 10:05 am, and we will look into this process. The above date and location places all seven classical physical Vedic planets in only three houses of the birth chart, and this occurs for at least a 24 hour period throughout the entire calendar day. Tuesday is a Mars-ruled day, from sunrise Tuesday to sunrise Wednesday. A Mars-ruled day seems appropriate in this case for warrior life themes and/or warrior efforts to obtain and keep her source material, entering actual war zones or zones of conflict in various ways. If natal Mars is strongly placed in the chart, it gives a person physical vitality and the ability to compete and overcome obstacles effectively. Moon remains in Taurus until Jan. 17th, receiving Jupiter’s benefic aspect. When planets are in only three houses of the chart, it is known as a Sankhya Shoola yoga, Shoola meaning “thorn” and associated with struggle and with a “thorn in one’s side.” This yoga gives a very intense life, with certain major upheavals and opportunities, all depending on the house and sign placement of the planets. This is reflected in the single-minded intensity with which Poitras works and lives, with her enormous sense of obligation towards both her art and her subjects, which appears to be inextricable. In addition, there is the Sanyasin yoga, when four or more planets (excluding Rahu and Ketu) are in one house and one sign. Sanyasin means “renunciate” and can indicate that even if a person is not celibate, they renounce almost everything to do one thing or live a certain kind of life. To be a real ascetic the 10th lord must be involved in the Sanyasin yoga and the yoga should be situated in an angular or trinal house. This does not occur with the Pisces Ascendant. Also, the strongest planet in the Shoola yoga should indicate the nature of the Sanyasin yoga. The Shadbala ranking gives Venus the edge, but Venus is closely combust the Sun in Capricorn, and in the Sun’s nakshatra, Uttara Ashadha (“the later victor”). When Venus is the strongest in the planetary combination “the renunciate is a wanderer and follower of the materialistic school.” However, since Venus is also combust “the person does not become a saint himself but has great reverence for saints.” (Both quotes are from K.S. Charak, Yogas in Astrology, 1995, p. 199. These may be Dr. Charak’s translations from the relevant Sanskrit verses.) With Venus and Sun Vargottama in Capricorn (repeating in the Navamsha chart in the same sign), this gives further power to Venus, ruler of the arts, and favors its placement in the 5th house of the Navamsha chart, aspected by exalted Jupiter. Jupiter has the highest bindu count in the birth chart grouping, at 6 (out of 8) bindus, bringing qualities of self-restraint, self-discipline and even celibacy. So many planets in Capricorn also add to the qualities of being highly organized, disciplined and practical. The fact that Poitras appears to have no romantic partner over the years may well reflect this type of Sanyasin yoga. Another factor may confirm this point and we will come to that shortly. So many planets in Capricorn can be seen as obligation to be of service, especially with a Pisces Ascendant. In any case, the life of the Pisces Ascendant person is more given to sacrifice, more willing to sacrifice everything in order to reach certain goals, and potentially losing a sense of purpose if the object of the central driving emotional force has disappeared or dissipated for whatever reason. But the tendency to get lost is greatly mitigated by the intensity of the six planets in Capricorn, an earth sign. Even so, we see some echoes from the Shoola and Sanyasin yogas in the willingness to sacrifice everything for her art and her work. Further, merging with her subjects yet preferring to stay in the background as much as possible, while focusing on themes of social justice and various themes of government malfeasance – all of this would tend to give a water sign Ascendant, especially as so much of her material takes us (and her) into zones of human sacrifice, often in hospitals or prisons (Pisces or 12th house realms). Poitras is a tall woman of broad frame, perhaps tending to put on weight, typical of a watery Ascendant. Poitras almost always wears black, which may merit a Scorpio Ascendant, or an Ascendant or Ascendant lord with heavy Saturn influence. Saturn aspects the Pisces Ascendant from an 11th house position. With a Jupiter-ruled chart, Jupiter is debilitated in Capricorn but becomes Neecha Bhanga, corrected by the presence of Saturn also in Capricorn. Another correction is due to Jupiter exalted in Cancer in the Navamsha chart. Jupiter’s sign lord is Saturn in Capricorn and its nakshatra lord is an exalted Moon, further strengthening Jupiter as Ascendant lord, giving it both emotional depth (from the Moon, which it also aspects) and organizational abilities (from Saturn in its own sign of Capricorn), though starting from a place of some disadvantage or disorientation as a debilitated planet. In her case, she found her calling around age 30 and graduated at age 34, if 1962 is the correct birth year. The dual sign Ascendant reflects the possibility of some confusion arising in the choice of career. It also reflects her tremendous versatility, flexibility and technical expertise, along with a real compassion for her subjects (Pisces). Yet she is not so much an advocate for her subjects as a scrupulous documenter of whatever she considers important for the audience to see. With Citizenfour, for instance, she has said she doesn’t personally think Snowden will be viewed as a traitor in the long run, but she wants her viewers to decide for themselves. Filmmaking is associated most strongly with the 5th house. With Pisces Ascendant, the 5th house is Cancer, ruled by Vargottama exalted Moon in the 3rd house, receiving Jupiter’s aspect. The 5th house is aspected by six planets in Capricorn, including Jupiter, in addition to the 8th house aspect from Mars. This directs a lot of planetary energy to the 5th house of creative enterprises, including the film arts; and the full house in Capricorn in the 11th house sends many important collaborators and friends her way. Rahu in the 5th house is not easy for having or bearing children, but if you are artistically creative (both 5th house arenas), Rahu promotes work which is exotic and may well take you to foreign places. Rahu and Ketu bring turbulence and unpredictability to houses they occupy in the chart. Poitras found her chief subjects in the midst of war zones and disaster areas, such as Ground Zero on 9/11. This has fuelled much of her output ever since. Placing the bundle of six planets in the 11th house from the Ascendant reflects the power of Poitras’s friends and colleagues to help her or choose her, as is obvious from her life story. It gives her a multitude of personal connections, even if she remains cocooned at times to do her work. Planets in the 3rd and 11th houses also describe the likelihood of an older and younger sibling (11th and 3rd houses, respectively). She has sisters both older and younger. With any Ascendant on Jan. 16, 1962, the six planets in Capricorn are in the 9th house from the Moon in Taurus. This reflects the large amount of international travel and broader education she has gleaned through international travel and higher learning. Poitras has a sweet, earnest and expressive face, but the distinguishing feature is her intense focus, her high intelligence and scrupulous honesty in covering her subjects. She dresses plainly, mostly in black, as noted, and wears little to no makeup or jewelry, all supporting a Saturn-influenced Ascendant and/or Ascendant lord. She appears to have strong physical and mental energy and excellent health and stamina. A Mars aspect to the Ascendant, especially as 9th lord, is good for physical vitality and promotes Dharma, i.e. finding fulfillment of one’s life purpose through career or the like. As Mars rules both the 2nd and 9th houses from Pisces Ascendant, it is also extremely well placed in the 10th house for financial and personal success, giving Raja and Dhana (wealth-giving) yogas. Mars achieves Digbala (best possible angle) when in the 10th house, as given here, and promotes success and visibility on many levels for the Pisces Ascendant person. From the 10th house, Mars also aspects the 4 and 5th houses, driving her education in a more disruptive and independent way, as did occur. Her strong interest in becoming a chef disappeared sometime in 1991 or 1992, which fits with a 10:05 am EST chart, placing the disruptive Rahu-Mars sub-period in the right time frame: in this case, March 17, 1992 to April 4, 1993. She moved to NYC in 1992, most likely fall 1992, to attend The New School, graduating with a B.A. in 1996. Her best work would have to come after the Mercury sub-period of Jupiter Dasha: Dec. 4, 1997 to March 11, 2000. Let us look at why that is. Mercury and Jupiter are within one degree of each other, creating a Graha Yuddha. Jupiter wins the Planetary War due to both its superior size and its brightness. This limits Mercury’s abilities to control matters over the houses it owns, along with the matters it rules in general. For Pisces Ascendant, this is the 4th and 7th houses. Poitras would tend to move often or have need to leave home often (4th house); and a romantic partner or potential spouse (7th house) would tend to have very little power or be very weak in some way, perhaps providing a rationale for avoiding such partnerships. This is also supported by the Sanyasin yoga, and as noted, there seems to be little evidence or even mention of any romantic partner for Poitras over the years. This Graha Yuddha should tell us that given the life of Laura Poitras to date, her birth chart would not be a Mercury-ruled chart. Otherwise, her physical health and stamina would be greatly compromised, which is not the case. It would also tend to eliminate a chart ruled by one of Mercury’s great friends: Venus and Saturn. This leaves Mars or Jupiter ruled charts: Aries, Scorpio, Sagittarius, and/or Pisces. And from these Ascendants, we have to observe the transits of Jupiter and Saturn, and whether they support her career progress. Ideally, tr. Saturn should be moving up over the horizon towards her 10th house from at least 2010. Only Pisces or Aries Ascendant charts provide this trajectory, and though Aries Ascendant is good for describing a revolutionary, and places the six planets strongly in the 10th house of status and career, this Ascendant gives more possibility of romantic partnerships. Also, her speech would be much more emotional with Moon in the 2nd house, and her eating habits, her financial life and her family relationships could be more volatile. All of this would not seem to apply. Natal Moon on the travel axis (Houses 3-9) makes more sense in this case, as she travels a great deal and has encountered so many ups and downs through her numerous travels. When Mercury loses in Graha Yuddha, it may bring a speech defect or a problem with the vocal chords, as in the case of master chef Julia Child. Voluminous expression or output is always possible with Mercury-Jupiter, even in Planetary War (note Woody Allen). But as Ascendant lord, Mercury brings physical weakness and suffering, as with the singer Karen Carpenter, though her songs lived on long after her tragic death at a young age. But the major or sub-periods of the conquered planet will tell the tale. Something important has to occur in Mercury major or minor period related to one’s means of expression and/or (as with Pisces Ascendant) in the history of her partnerships (if any). This would apply to her Jupiter-Mercury Vimshottari Dasha, ending March 11, 2000, using my speculative birth time of 10:05 am. She started filming in 1999 for her first awarded film, Flag Wars (2003). If this birth chart is correct, the project would do better after March 2000. Another reason defeated Mercury can work very well for Pisces Ascendant chart is that 7th house is not just partners but can be one’s competitors and/or enemies. With Mercury losing the war, Poitras’s enemies are defeated. This is a good reason to focus on April 8, 2012: the release of Glenn Greenwald’s article on her harassment by the authorities during international travel, followed the next day by a petition signed by numerous independent filmmakers. This date should coincide closely with the start of Poitras’s Saturn-Mercury sub-period. With the 10:05 am chart, Saturn-Mercury runs from April 7, 2012 to Dec. 17, 2014. Since her enemies (7th house lord Mercury) stopped harassing her from the time Glenn Greenwald’s article appeared on April 8, 2012, it seems to be a very important timing indicator. Also, from Sept. 2009, tr. Saturn is in Virgo in her 7th house and marches on up to the 10th house from then onwards. This is good for career visibility and a testament to her increased professional success and stature from that time, though her first film award was in 2003. Saturn Dasha from spring 2009 brought even more personal authority and success as lord of Jupiter’s sign, and lord of six planets in the sign of Capricorn. 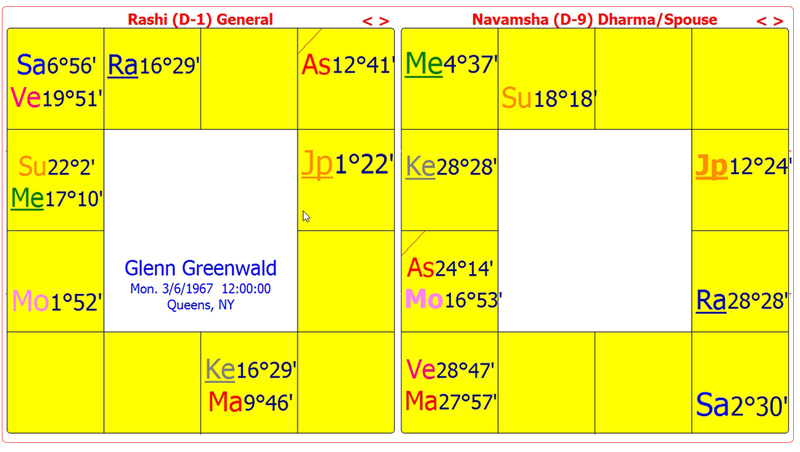 Navamsha Virgo Ascendant gives Saturn Digbala (best possible angle) in the 7th house, aspected by exalted Jupiter. Her film My Country, My Country was released Aug. 4, 2006, during her Jupiter-Mars Dasha. It was after this film was released that she began to get stopped at airports and interrogated, her equipment seized, etc. Her natal Mars tends to attract both success and trouble. At the top of the sky (10th house), it attracts attention, especially of the police or other like authorities (also Mars). With the 10:05 am chart Mars is situated in Scorpio in the Navamsha chart opposite the Moon. This is a wealth-giving yoga, but can also bring disruptions during travel (the 3-9 house axis). Like Poitras, Greenwald also currently lives outside the United States. He resides in Rio de Janeiro, in part to live with his partner David Miranda, who is a Brazilian citizen, and in part to avoid the same travel harassments and detainments that Poitras encountered. His secondary and higher education was conventional, attending his local high school in Lauderdale Lakes, Florida, followed by enrollment at George Washington University, where he majored in philosophy. After graduating with a B.A. in 1990, he attended New York University School Law, attaining a law degree in 1994. He started his blog Unclaimed Territory in Oct. 2005, and quickly distinguished himself in the field, receiving the 2005 Koufax Award for “Best New Blog” in April 2006. In Feb. 2007 he became a contributing writer at Salon.com. In 2009 he received the Izzy Award for Independent Media and in 2010 the Online Journalism Award for Best Commentary. Then on Aug. 20, 2012 Greenwald left Salon.com to write for The Guardian, citing “the opportunity to reach a new audience, to further internationalize my readership, and to be re-invigorated by a different environment.” Through the connection to Snowden and his revelations of NSA documents, Greenwald initiated major stories in The Guardian on U.S. national surveillance, starting on June 5, 2013. This was regarding the metadata being collected by the NSA from hundreds of millions of citizens, both in the U.S. and abroad, and without their knowledge or agreement. As with Poitras, Greenwald has received a long list of awards both for his journalism and his books, all of which focus on key political issues of our times, though largely focused on national security issues. His political focus began to be sharpened in 2005 and 2006 and was changed forever by the George W. Bush presidency and the War on Terrorism that Bush began and that has continued ever since. Glenn Greenwald was born Mon. March 6, 1967, Queens, New York (Source: Wikipedia). No time of day is available, so we will use 12 noon in this case, which turns out to be appropriate, though I have not done an in-depth rectification. A dual sign Ascendant may also fit in Greenwald’s case (Gemini or Virgo here), with his versatility and flexibility, speaking at least two languages fluently and changing professions after major training and experience in both of them. The Moon enters Capricorn at 8:26 am that day, where it receives an aspect from exalted Jupiter Vargottama (repeated in the Navamsha), though retrograde. This creates a very expansive and optimistic nature, which Greenwald exhibits, and bestows on him a Gaja Kesari yoga, a planetary combination bringing popularity and success. If Moon and Jupiter involve the 2nd house of speech, it can bring tremendous eloquence – with fire. The fire shows through natal Mars contacting Ketu in Libra in the 5th house, aspecting Moon in Capricorn (after 8:26 am). This is another reason to lobby for a birth time after 8:26 am when tr. Moon enters Capricorn. Though not an easy house position, nevertheless an 8th house Moon can contribute to being focused on deep research and investigation. With such a strong Jupiter, his Jupiter Dasha should coincide fairly closely with the start of his new career in journalism and the winding down of his career as a litigation attorney. It should also bring a new partner. Within one week they were living together. Gemini Ascendant might support this timing. In summer 2004, tr. Saturn was in Gemini aspecting the 7th house of partnerships, as was tr. Jupiter in Leo. When both these planets aspect the same house, there is a strong chance for manifestation of important events connected to that house. If the birth chart does not show partnership definitively, the Navamsha should confirm it. With Jupiter Dasha and natal Jupiter indicating spouse, both as Darakaraka (planet at the lowest degree of celestial longitude) and possibly also as 7th house lord, the Jupiter Dasha would also bring him a new and important partner. Miranda was immediately elevated financially through meeting Greenwald, though it appears they treat each other as equals. Miranda speaks fluent English, which he taught himself, and Greenwald speaks fluent Portuguese. Natal Mercury and Sun are in idealistic Aquarius, with Mercury retrograde, perhaps accounting for Greenwald’s very detailed and incisive work on whatever he investigates. Venus and Saturn are in Pisces, where Venus is exalted, further strengthened by an aspect from exalted Vargottama Jupiter. The two planets in Pisces connect closely with a possible Pisces Ascendant for Poitras. His obligation to Poitras (Saturn) and their obvious camaraderie (Venus) are seen from these contacts. Though Saturn may be closer to her Ascendant degree, his exalted Venus gives him a genuine devotion to his work and to anyone closely associated with his projects, including especially Edward Snowden. 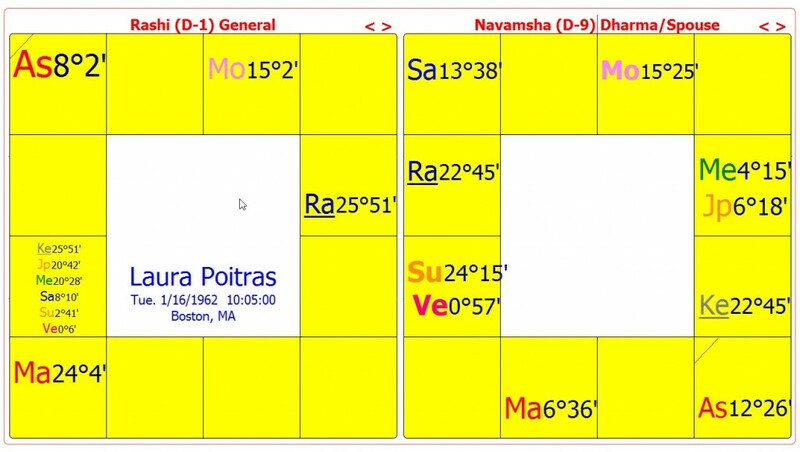 With a Capricorn Navamsha Ascendant, there is another close connection to the Poitras charts (birth chart and Navamsha). It also describes his happiness living abroad with a new love partner during Jupiter Dasha, especially with exalted Vargottama Jupiter in the 7th house (of foreign residence) in the Navamsha chart. All this points to a near noon chart, but further investigation would confirm it. Edith Hathaway is an international consultant in practice since 1980, author, teacher, and lecturer of Vedic astrology, and among the few contemporary astrologers trained and certified in systems of both East and West. She was a Founding member of the American Council of Vedic Astrology and since 1992 has served as a faculty and board member of both the American Council and American College of Vedic Astrology. She has received numerous certificates and awards from leading astrological organizations, including the Jyotish Brihaspati, the highest award given by the Council of Vedic Astrology (CVA). Her articles and lectures are available at her website www.edithhathaway.com, along with testimonials and reviews of her most recent book, In Search of Destiny: Biography, History & Culture As Told Through Vedic Astrology, 2012. The paperback version of In Search of Destiny may be purchased at her website, and both paperback and Kindle e-book versions are available at Amazon USA, Amazon Europe and elsewhere. See her website store for her lecture mp3s along with accompanying PDF files. In Search of Destiny is a winner in the category of Nonfiction E-book from Eric Hoffer Book Awards for books published in 2012. The book is cited as “[bringing] an understanding of the astrological science via explanation and examination wrought through the lens of time and culture.” In Search of Destiny is also a Finalist in the San Diego Book Awards for books published in 2012 in the category of Nonfiction: Spiritual and Inspirational.